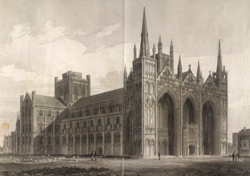 Built between 1118 and 1238 as a Benedictine abbey, Peterborough cathedral was known for its distinctive three-arch gothic portico front. Daniel Defoe noted that "the glory of Peterborough is the cathedral, which is truly fine and beautiful; the building appears to be more modern, than the story of raising this pile implies, and it only wants a fine tower steeple, and a spire on top of it." There were a number of royal burials here, including those of Catharine of Aragon and Mary, Queen of Scots.